Sonic and company are back and better than ever in Sonic Adventure 2: Battle for Nintendo GameCube. Dr. Eggman is up to his old tricks, and it's up to Sonic, Tails, and Knuckles to stop him yet again. Two new playable characters enter the Sonic universe -- a mysterious dark hedgehog called Shadow, and a jewel-thieving bat named Rouge. In the single-player mode, you'll go through more than 30 unique stages, which include everything from a forgotten pyramid, an abandoned military base, and a giant space station. 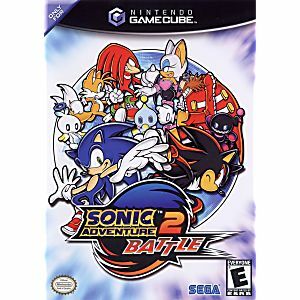 Sonic Adventure 2: Battle features faster action, all-new two-player games, and a branching storyline that lets you choose to save the world as the Hero side, or conquer it as the Dark side. My first video game, and being at least 4 years old (maybe 5 years old), it was always a fun game to play. 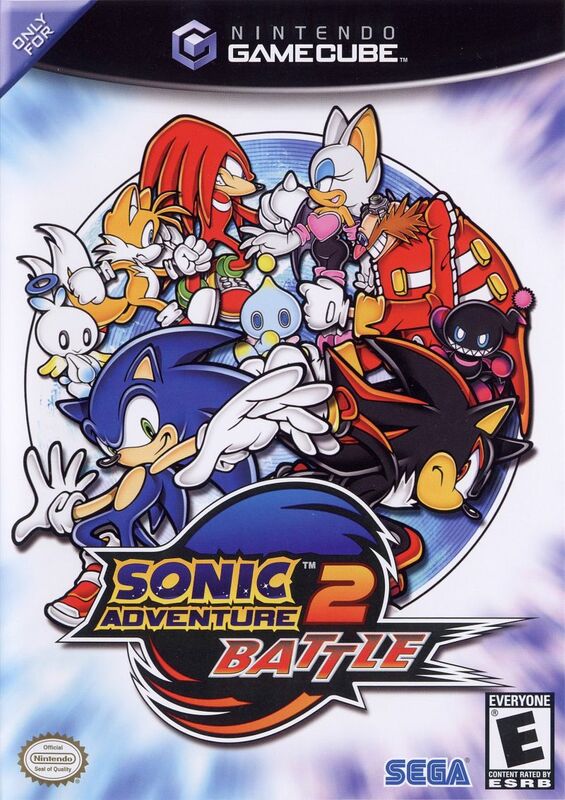 In this game, you play through "Hero" and "Dark" storylines (both each their own story), the hero one to stop the dark storyline (with Sonic, Tails and Knuckles to play as), and the dark storyline based on a plot to conquer the world (with Dr. Eggman, Shadow, and Rouge to play as). The gameplay is separated into three distinct styles. The first is an action speed-based platformer with the main goal to make it to the end of the stage, a shooter/platformer hybrid where you target enemies with the Lock-on and fire at them with Lock-on Missiles (though they look like lasers), and a treasure hunting segment where you have to find three items (each of those three items related to each other) to complete the stage. Getting back to the story, what probably would've benefited the story more would've been a few extra cutscenes and stages to bring the story a bit together, as well as handling the concept of Shadow unwittingly framing Sonic for a crime. The game treats Shadow as Sonic's twin in the eyes of anyone who's seen Sonic before, but not Shadow. It's only until they get a closer look that they notice the difference. I suppose that they were going for a "wait a minute, that isn't Sonic" reaction from the audience, but it would've made more sense for a disguise for Shadow (as Sonic). Even when I first played this game (which I faintly recall being in preschool/kindergarten at the time), it just briefly confused me on the colors blue and black. Aside from that the story is not that bad. In actuality it has a satisfying amount of good moments in it to keep the audience engaged. Some might disagree, but it can depend a lot on how one views certain points of a story. One could claim that a story didn't mention a character's name, despite the game mentioning it roughly a minute before. That's not the case with this game, just an example for another game. But returning to the game itself, it's also not bad. I've seen others on the Internet exclaim their thoughts, and there are some that this game has aged roughly in some spots, like Sonic Adventure. Only it seems to be in the regard with gameplay this time. I think that this game had aged a bit more gracefully that Sonic Adventure based on its improved presentation and how its gameplay was handled, and that's just a few of the improvements in this installment. But hey, that's just me. Just a guy with an opinion. I wasn't sure if I could trust this site or not, but they did their job! It came when it was supposed to and works perfectly fine! Super satisfied and definitely will buy games from here again :D next purchase imma make is Luigi's mansion and hopefully super smash bros melee! Shipping was fast and it came in perfect condition! I used to play this game years ago before I lost my game case with all of my gamecube games in it. I was very happy to be able to play it again! My game arrived a day earlier than the expected date, in absolutely perfect condition. The game itself is so fun to play. Brings back so many memories. I was just glad I stumbled upon this website, as several other individual sellers, were asking almost a hundred dollars for this same game. There was no way I was paying that and was so disappointed. Thank you Lukie Games for saving the day! This game is absolutely incredible. It has a very engaging, bittersweet story, colourful characters, and not to mention an amazing soundtrack. The game features two different stories you can play (Hero - with Sonic, or Dark - with Shadow), and there's a variety of gameplay style (Sonic's fast gameplay (my favourite), Tails' shooter/platforming gameplay, and Knuckles' scavenger hunt/puzzle gameplay). So far, I've only played the Hero story, but I will start the Dark story soon. I highly recommend this masterpiece of a game to beginners, and experienced players. I've absolutely loved this game since I was a kid and really want to find it for a good price. The price is reasonable and the my item arrived very fast. Loved the condition it was in as well. this game has great single player and multi player, and the fact that the chao garden bonus on here can connect to the Gameboys tiny chao garden is geat. The best 3D Sonic game ever? Sonic Adventure 2 for the Dreamcast was what most people called the best 3D Sonic game. Now here's the port for Gamecube. Not only is it in all of its former glory but with bonus goodies as well. The multiplayer has new modes and is A LOT better this time around and a few other things make this port stand out better than the original. As for the game itself, I think it really is the best Sonic game in 3D. Not only does it have a good story for Sonic standards but the gameplay is really good, the best Sonic has to offer. While I wish there was less mech and scavenger levels and a lot more Sonic and Shadow levels, which are the best part of the game, those levels aren't too bad and some are quite good. Anyhow, if you haven't played the game yet (and don't own a Dreamcast) this is totally recommended. GET. IT.